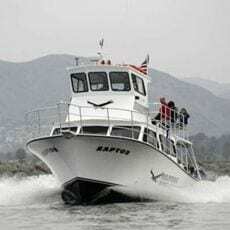 Fast, comfortable and spacious, the Raptor is only 40 minutes from Ventura Harbor to spectacular Channel Island dive sites. The Raptor is built from the keel up specifically as a dive charter boat, for the Eastern Pacific Coastal Waters. Come out and get the resort experience right here at home. Diving is supposed to be fun and convenient and that’s what it is on the Raptor.